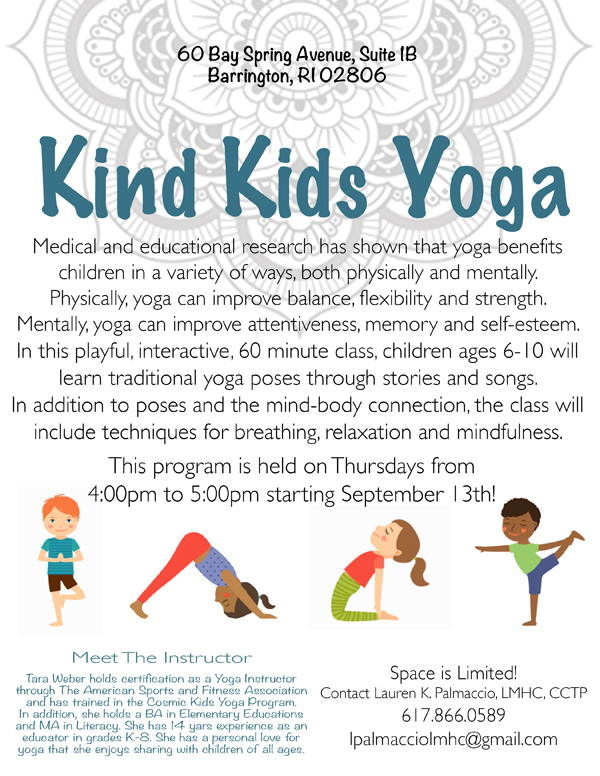 Kind Kids Yoga program to start September 13th. Will be held every Thursday from 4:00pm – 5:00pm. Space is Limited! While yoga has existed for thousands of years, it is a relatively new concept to the Western world. Most of us know the basics – that there are varying positions and meditation involved – however the depth of benefits are somewhat lesser known and the practice in general can seem unapproachable. Many of us can’t imagine ourselves being capable of contorting into the positions we associate with yoga. What is important to know is that yoga can be accessed at any level of experience or flexibility, and also at any age. Some classes are advanced yes, but many are designed for beginners or people with limited mobility. Restorative yoga hardly requires complex positioning and focuses on healing frayed nerves. Now that you know regardless of your experience there is indeed a yoga class out there for you, consider the many benefits and reasons why it might be a great option for you or your child. Yoga provides physical exercise and strengthening of the muscles, which in turn releases endorphins and improves the mood. Yoga can improve balance, flexibility and strength. The practice can help a person regulate their physiology — decreasing hyperarousal states such as anxiety or anger or increasing hypoarousal states such as lethargy or depression. Mentally, yoga helps improve attentiveness, memory and even self-esteem. It can provide a social resource and sense of community to individuals who are isolated or lonely. It can challenge a child’s ability to follow instructions and improve their adherence to structure. Millions of Americans utilize yoga as their adaptive coping skill and find it to be an important component of maintaining their mental health, not just their physical fitness. Palmaccio Therapy is pleased to announce that we will be offering a children’s yoga class called Kind Kids Yoga starting this September. Check out the flyer below for more information!